Felipe Massa heads the drivers’ championship after a decisive victory at Magny-Cours. 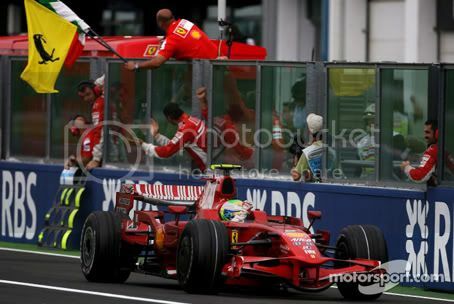 The Brazilian was behind his Ferrari team-mate in the first 38 of the 70 laps race, but when Kimi Raikkonen developed an exhaust problem (losing him vital horsepower), Massa was able to benefit and take the chequered flag. Even though Raikkonen had a problem with his F2008, the pace of the red cars was significant compared to the rest of the 20-car field. Jarno Trulli finished in a distant third, earning the team’s first podium since Melbourne 2006. It was nice gesture for Trulli to dedicate this podium finish to the former Toyota team boss Ove Andersson, who was killed in a car crash earlier this month. The Italian was under extreme pressure from McLaren’s Heikki Kovalainen in the closing stages of the race. On the run down to the Imola chicane, the Finn tried a move around the outside. The two cars touched but Trulli held the racing line and stayed in front. As for Lewis Hamilton, this wasn’t a great weekend for the British driver. After his mistake in Canada in which he was penalised by crashing into the back of Raikkonen’s Ferrari in the pits, Lewis had a tough race in the French Grand Prix. Starting from P13 on the grid, he was given a second penalty (a drive-through) when he cut the Nurburgring chicane while passing Sebastian Vettel on the opening lap. It was a little harsh by the race stewards in my opinion – Lewis couldn’t take the racing line into the chicane after just passing the Toro Rosso. He was going way too fast! So with this punishment and his low grid position, Hamilton’s race was already comprised. He tried in vain to regain lost ground by overtaking several cars, including arch-rival Fernando Alonso, but in the end Lewis finished tenth. 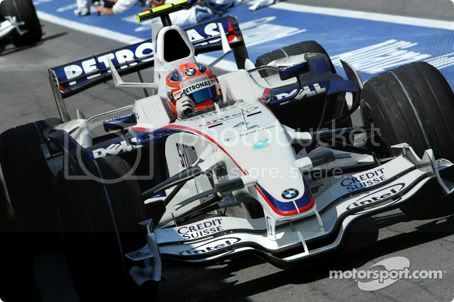 After winning the previous race in Montreal, Robert Kubica struggled with pace in the BMW Sauber. The Polish driver lacked the performance many people when expecting and to finish sixth was disappointing. At least Robert did a better job behind the wheel of the F1.08, as team-mate Nick Heidfeld was the last remaining runner on the lead lap (he finished P13). Red Bull Racing’s Mark Webber led home an intense and private Renault battle with sixth, ahead of Nelson Piquet (who scored his first points of the season), Fernando Alonso and David Coulthard. The young Brazilian was able to move ahead of his Renault team leader when Alonso slid wide when lapping Giancarlo Fisichella’s Force India three laps from the end. It was a great result for Piquet after several bad races. Toyota’s Timo Glock hung to eleventh position despite a late challenge from Vettel in the Toro Rosso. Nick Heidfeld was a disappointing P13 for BMW Sauber (he finished second in Montreal). Rubens Barrichello, who started from the back of the grid after a gearbox change, was the first lapped runner in P14 heading home the Williams duo of Kazuki Nakajima and Nico Rosberg (who also received a penalty in the pit-lane crash at Montreal). Sebastien Bourdais was P17 for Toro Rosso ahead of Giancarlo Fisichella and Adrian Sutil in their Force Indias. Jenson Button was the only retirement after his Honda made first-lap contact with Bourdais and sustained irreparable damage. Massa’s third Grand Prix victory of the season (the eighth in his Formula One career) means he becomes the fourth driver to lead the championship standings. In addition, Massa is the first Brazilian to lead the world championship since the late great Ayrton Senna back in 1993. He has 48 points compare to Kubica’s 46 and Raikkonen’s 43. Hamilton trails with 38 after his second race without scoring points. Meanwhile Ferrari extends their lead in the constructors’ championship to a commanding 17 points over BMW Sauber. World champion Kimi Raikkonen claimed Ferrari’s 200th pole position as he and team-mate Felipe Massa locked out the front row. The qualifying session at Magny-Cours became a private duel between the Scuderia pair, with each setting the quickest time around the 2.741-mile race track. Massa initially set the pace with his impressive Q1 and Q2 performance but in the session that matter the most – the top ten shootout – it was Raikkonen who took the honours with a lap time of one minute, 16.449 seconds. Even though Lewis Hamilton was third fastest, the McLaren driver has be demoted ten places following his pit-lane incident in the Canadian Grand Prix a fortnight ago. So lining up behind the red cars will be Fernando Alonso in the Renault. Toyota’s Jarno Trulli also moves up a place and will join the double world champion on row two. Heikki Kovalainen lines up in fifth place for McLaren ahead of Montreal winner Robert Kubica. The championship leader seemed to lack the outright pace compare to Ferrari and McLaren, which is a surprise as you would expect the BMW Sauber to continue that winning performance after Canada… Both Kubica and team-mate Nick Heidfeld (who is down in eleventh) will experience a difficult race on Sunday with these low grid positions. Red Bull Racing takes up row four with Mark Webber edging ahead of team-mate David Coulthard, despite being slowed on his first Q3 lap when Trulli had a spin in his path at the 180 corner. Timo Glock will start the French Grand Prix in ninth alongside the under-pressure Renault driver of Nelson Piquet. The Brazilian needs to put in a solid performance after seven disappointing races. His future at the team hangs in balance if he suffers another non-finish. Sunday’s French Grand Prix will provide some interesting stories especially in the drivers’ championship. Kubica currents leads with 42 points but can Kimi Raikkonen (who is down in fourth in the standings) ignite his season campaign with race victory? What about Massa? Can the Brazilian challenge his Ferrari team-mate? And as for Hamilton, the British driver needs to take big risks by overtaking several cars if he wants to score big. In addition, there is a small possibility of rain heading to Circuit de Nevers on race day. So will Lewis benefit the bad weather to his advantage with his low grid position? Lets wait and see. Twelve months on after his horrific crash, Robert Kubica claimed his maiden win at the Circuit Gilles Villeneuve. Kubica led home his team-mate Nick Heidfeld, giving BMW Sauber both their first victory and first one-two as a full Formula 1 constructor. It had been a remarkable turnaround for the Polish driver following a year on from his atrocious crash at the street circuit. His debut victory for BMW – the manufacturer’s first since taking over Peter Sauber’s team back in 2006 – means Robert now heads the drivers’ standings for the first time in his Grand Prix career. David Coulthard finished in an excellent third position for Red Bull Racing despite issues with his brakes. The Scot avoided all the chaos and made a decisive pit stop during the Safety Car period to take his place on the podium. It was DC’s first top three finish since the Monaco Grand Prix back in 2006. The podium finishers all benefitted from the race’s most dramatic moment, when championship leader Lewis Hamilton crashed into the back of Kimi Raikkonen in the pits! Prior to the bizarre incident, Hamilton was on course for a dominant victory. The McLaren driver led away from pole position and was pulling away with ease from Kubica and Raikkonen in the early laps. But when Adrian Sutil parked his Force India on the entrance to Turn 3 on lap 17, race control decided to deploy the Safety Car. All of the leading runners headed to the pits to take advantage of the caution period. Hamilton came into the pit lane first but a poor pit-stop by the McLaren mechanics meant he lost ground to Raikkonen and Kubica. The Ferrari and BMW then dutifully halted at the pit lane exit because the red light was flashing away to signal the drivers NOT to return back onto the race circuit. It was at this moment Hamilton ploughed into the back of the Ferrari! As for Nico Rosberg – who gained fourth position after passing Fernando Alonso’s Renault at the first corner – the Williams driver also got caught out in the pit exit mayhem! Unlike Raikkonen and Hamilton, though, Rosberg was able to continue after a second stop for repairs. He would later on finish in tenth. That incident in the pits and the Safety Car period meant that the midfields runners were able to score big in this dramatic Canadian Grand Prix. Toyota opted for a single pit stop for both of its drivers and at the chequered flag, Timo Glock broke his 2008 duck with fourth – two places ahead of team-mate Jarno Trulli. Split between the Japanese cars was Felipe Massa in the sole remaining Ferrari. The Brazilian had a topsy-turvy afternoon behind the wheel of his F2008. First, a miscommunication from his team meant he had to make an extra pit stop during the Safety Car period (the Ferrari mechanics had the wrong fuel pump for him). Then he lost even more ground when Felipe had to make a late ‘splash-and-dash’ pit stop with 18 laps to go. This was frustrating for Massa, as the Ferraris had the speed to match the McLarens in race trim. Still, this didn’t hinder the Brazilian in terms of pulling off some fantastic overtaking manoeuvres, in particular on lap 50 when he passed both Rubens Barrichello and Heikki Kovalainen in one go! Actually, Kovalainen was caught out by the fragile track surface at the hairpin (the scene in which many drivers were voicing their concerns to the race organisers). Heikki slid wide with Barrichello and that allow Massa to slip through down the inside. The Finn then spent the remaining part of the race in a huge battle with the Honda and Toro Rosso’s Sebastian Vettel for the final point-scoring positions. 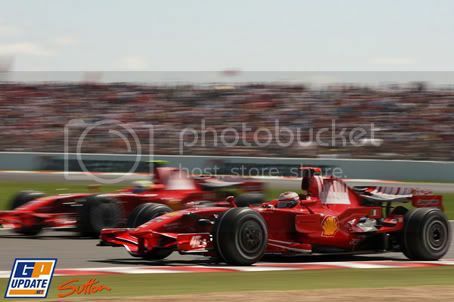 But in the end, Heikki was unable to pass Vettel and finished in ninth. Rosberg completed the top ten after his early delay in the pits, finishing ahead of Jenson Button, Mark Webber and Sebastien Bourdais. His Williams team-mate Kazuki Nakajima was heading for another strong result but had to retire after damaging his front wing on the rear of Button’s Honda. The dislodged wing then wedged under the front of the Williams and sent it into the wall in the pit entrance. As for Renault, it was a bad day for Flavio Briatore as Nelson Piquet Jr. was forced to retire after spinning while chasing team-mate Alonso. The double world champion also spun when trying to pass Nick Heidfeld’s BMW Sauber. Alonso blamed the crumbling track surface when he hit the wall on lap 45. Giancarlo Fisichella became the final retirement when he crashed his Force India on the way out of Turn 4. So a fantastic result for Robert Kubica. His breakthrough victory after 28 races is a great achievement. I bet Mario Theissen, the team principal, is feeling ecstatic with this result, but I do feel sorry for Nick Heidfeld though. The German was unable to make use of his heavy-fuelled car in the middle stint of the race and that elusive win for Nick will come soon. Kubica now leads the drivers’ standings with 42 points, four points ahead of Lewis Hamilton and Felipe Massa. BMW Sauber now moves into second position in the constructors’ championship, three points behind leader Ferrari and 17 points ahead of McLaren-Mercedes. Next race: French Grand Prix, Magny-Cours. June 20-22. UPDATE: Lewis Hamilton and Nico Rosberg will lose ten places on the grid at the French Grand Prix following their pit lane incident in Canada. Hamilton crashed into the back of Ferrari’s Kimi Raikkonen at the end of the pit lane on lap 20, when the Finn braked to stop in front of the red light. The Briton said he saw the light too late and could not avoid hitting the Ferrari. Both men retired in the accident. Rosberg could not stop in time either and hit Hamilton from behind, although the Williams driver was able to continue in the race. Both Hamilton and Rosberg will be hit with a 10-place grid penalty in France in two weeks’ time. Lewis Hamilton is on target by repeating his maiden victory at the Canadian Grand Prix after taking a stunning pole position at the Circuit Gilles Villeneuve. The McLaren driver was easily the fastest around the race track after topping the time sheets in both session one and two of qualifying. His pole position lap of one minute, 17. 886 seconds was over half a second quicker than his nearest rival, the BMW Sauber of Robert Kubica. It was Hamilton’s eighth career pole, his second this season. Sharing the front row is Kubica. It was a remarkable performance from the Polish driver, especially after his horrific crash twelve months ago. Robert would have shocked the Formula One paddock with his late charge for pole position, but second is still a great achievement for the team and driver. Race favourites Ferrari could only manage third and sixth. World champion Kimi Raikkonen struggled for grip on a track that was breaking up and the Finn will start the race in third, nearly a second adrift from championship rival Hamilton. Team-mate Felipe Massa was unable to continue his impressive qualifying form and will line up in sixth. Between the red cars are double world Fernando Alonso (Renault) and Nico Rosberg (Williams), fourth and fifth respectively. Hamilton’s McLaren colleague Heikki Kovalainen lines up in seventh with Nick Heidfeld – again out-qualified by team-mate Kubica – in eighth. Honda’s Rubens Barrichello took ninth spot while Mark Webber was unable to take part in the final part of qualifying after damaging his car at the end of the previous session. The Red Bull driver has expressed his concerns to the race organisers about the state of the circuit and there are question marks whether the Grand Prix will take place due to the deteriorating nature of the track’s surface. Sunday’s Canadian Grand Prix could well be very unpredictable, even if the outside chance of rain doesn’t materialise. Indiana Jones and the Kingdom of the Crystal Skull – review with spoilers! Oh dear… My childhood memories of high-speed chases, menacing Nazis and the pure sense of adventure when exploring different parts of the world looking for mysterious artifacts in the company of Doctor Henry Jones ‘Junior’ a.k.a. Indiana Jones has been shattered. It has been 19 years since we last joined the part-time professor and archaeologist in his action-packed adventures. Over the time since Indy rode off into the sunset in the closing scene of The Last Crusade, the fourth film has been in ‘development hell’ in terms of creating the perfect story. Director Steven Spielberg, executive producer George Lucas and Hollywood legend Harrison Ford rejected script after script, due to disagreement over the direction the fourth Indiana Jones would take. None of them agreed upon the story until the concept of setting it in the 1950s – during the Cold War and involving aliens – was taken further. Lucas suggested the crystal skulls to ground the idea and after some redrafts, Indiana Jones and the Kingdom of the Crystal Skull was ready to start shooting. Spielberg wanted to maintain the ‘look and feel’ from his past three Indiana Jones films by not shooting the film digitally (unlike George Lucas with his Star Wars prequels). So when watching Kingdom of the Crystal Skull??????? ?, you get the impression that it hasn’t been that long since The Last Crusade. The Oscar-winning director mentioned he wanted to do the action-scenes ‘old school’ by opting out of the use of digital effects, giving the sense of realism. In spite of this, the truck-chase scene set in the jungle ended up as CGI. Despite being 65 years old, Harrison Ford still looks the part of Doctor Jones – outfitted in his trademark leather jacket, fedora hat and whip. Some critics might say he is too old to play the part of the adventurer but in Kingdom of the Crystal Skull, Ford still manages to pull off the action scenes with ease and confidence. Karen Allen returns as Indy’s love interest by reprising the role of Marion Ravenwood. It’s amusing to see Marion and Indy together again, as the last time the pair made an appearance was Raiders of the Lost Ark back in 1981! Since that time, Marion has got married and had a son. Ah yes, the son that turns out to be a youthful and arrogant parody of Indiana Jones. From Spielberg and Lucas I got the impression that this character, Mutt Williams (played by Shia LeBeouf) could be the next action hero if they want to continue making Indiana Jones in the near future. I hope not as Shia LeBeouf’s performance was dreadful. He might have made a grand entrance in the film by riding his motorbike, wearing the same outfit as Marlon Brando in The Wild One… His character – Mutt Williams – was simply annoying. His cockiness and banter with the older and wiser Jones wasn’t convincing and the image of Mutt swinging through the trees with his monkey friends during the truck-chase scene was unforgivable. Worse still are the fellow cast members. Ray Winstone plays Indy’s friend ‘Mac’ who is either working with him or backstabbing the archaeologist by teaming up with the Russians. Ray’s character was simply irritating and I hated the way he called Indy ‘Jonesy’. Good for ‘Jonesy’ to punch him in the face every time he said it! John Hurt plays Professor Harold Oxley who seems to be high after being possessed by the strange power of the crystal skull… He becomes ‘sane’ at the end but his presence wasn’t memorable in any way. Jim Broadbent’s role was underused and he lacked the charm of Marcus Brody (the late Denholm Elliott) as Dean Charles Stanford. As for Cate Blanchett, who played the villainous Soviet agent Irina Spalko, she was not scary or threatening when compared to other bad guys in the previous Indiana Jones films. It’s not the actress’ fault (she has won an Oscar for her portrayal of Elizabeth) and the blame lies solely on the material that was written for the part. What about the new threat to Indiana Jones, the Russians? Well, I’m surprised to say this but the Nazis were more sinister in their evil ways compared to the Russians. But the worst aspect of Indiana Jones and the Kingdom of the Crystal Skull is the main plot. After years of delay, you would expect a more convincing storyline than what is shown on the big screen. Set in the 1950s, the film opens with a grizzled Indiana Jones being forced to locate a mysterious crate (that is highly magnetic) inside a hanger in Area 51 for the evil psychic Irina Spalko. After escaping the Russians (and dodging a nuclear blast by hiding inside a fridge! 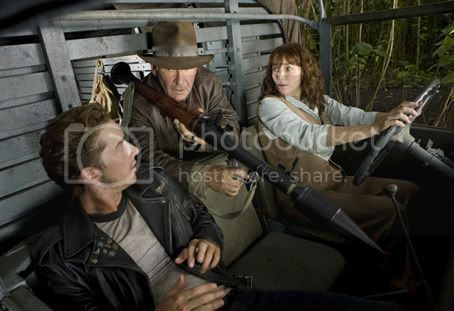 ), Indy meets young Mutt Williams who tells him that his mother has disappeared and has sent him to ask Indy for help. Following a trail of clues, Indy and Mutt travel to a South American jungle in search of Professor Oxley and Mutt’s mother. Decoding Oxley’s ramblings, Indy realises that he has to return a mysterious crystal skull to the lost golden city of Akator, while keeping one step ahead of the Russians. It might sound exciting but compared to the previous adventures in Raiders of the Lost Ark, Temple of Doom and The Last Crusade, the new fourth Indiana Jones is a disappointment. The magic and appeal that made the first three films a delight is missing from Kingdom of the Crystal Skull and some of the scenes felt unnecessary, especially the chase scene in the jungle followed by giant flesh-eating ants! I had high hopes, being a fan of Doctor Jones for many years, but I feel Spielberg and Lucas have betrayed my childhood memories forever with this horrendous film. It’s time for Indy to hang up his hat.